help in the global fight against climate change through carbon sequestration. Coffee producers are already experiencing the effects of climate disruption, including rising temperatures, distorted rain patterns and increased problems with pest and disease. Make no mistake, if left unchecked, all of these factors threaten your morning cup of coffee! While the response of Big Agriculture is to engineer new coffee varietals that are hardier or more resistant to pests, it turns out that that coffee grown in a traditional agro-forest (aka Bird Friendly certifiable coffee) is already protected from much of the climate disruption challenge. The forests protect against sudden temperature changes keeping the coffee trees cooler on warmer days and warmer on cooler days. They protect the plants from damage caused by heavy rains by acting as an umbrella, prevent landslides after heavy rains and attract birds that help control pests. But not only do Bird Friendly agro-forests provide resilience to climate change, they also mitigate it through carbon sequestration. The International Panel on Climate Change (IPCC) lists agro-forestry as a land use strategy to mitigate climate disruption. Although the level of carbon sequestration may be higher in other options, Bird Friendly coffee farms additionally preserve biodiversity and provide stable living income to growers. With benefits in both climate change mitigation and in resilience to climate disruption effects, Bird Friendly coffee is an excellent part of the climate change solution. You can choose to support Bird Friendly growers by purchasing our certified Bird Friendly coffee! It’s a way to treat yourself and do some good. We are offering you a chance to win one of 2 pairs of tickets to the sold out Lakeshorts Film Festival! We have been sponsoring the festival since it started 9 years ago. The festival is a lot of fun! Walk the Blue Carpet and mingle with guests and filmmakers. There are refreshments from Steamwhistle, Redstone Winery and Trail Estate Winery. There will be food from local establishments. Contestants should indicate the night that you prefer to attend, with #LovedandLocal or #Gala in your social media post. Winners will be announced on FB and Insta on Monday, April 29th. Send as many entries as you want! We’ll choose the winners by chance or inspiration. We humans share collective responsibility to protect the natural health of Ontario, Canada and the planet. We are proud to join a group of distinguished Canadians: Indigenous groups, environmental groups and progressive businesses in signing a joint statement in response to the Ontario Government’s review of the Endangered Species Act. We signed this for the Forests, and for the wetlands; for the wolves, the cougars and the caribou; for the barn owls, the golden wing warblers and for the wood thrush with its beautiful haunting song. We signed for the monarch butterfly, the rusty patch bumble bee and the magnificent ancient snapping turtle. We signed for the long list of other plants, fish, reptiles, insects and mammals – all threatened or endangered by our actions. We speak for them and for the unborn generations of people who deserve to know the life that we love. We need to act. Now is not the time to look away. Please join us. Coffee likes to rest after being roasted. Flavours develop over 1 to 5 days after roasting and then fade slowly over the next 4-6 weeks. The oils in coffee are not oils… they are soluble and flavourful organic compounds. Delicious coffee flavours turn rancid and taste bitter after between 8 and 12 weeks. That is why we have always roast dated our coffee! We were the first roaster in Canada to roast date our coffee back in 2003. Bold coffee is not necessarily Dark. Roasting coffee very dark can destroy the delicious flavour compounds and render them all towards charcoal. Why use specialty grade coffee only to char the interest out of it? Coffee absorbs aromas! It should be stored away from other “smelly” things like onions and perfumed soap. The fridge and freezer are full of random smells that can ruin your coffee. Espresso is not a roast level, nor a kind of coffee. Espresso is a method of preparation in which the hot water is pushed through the grounds under pressure. Crema in espresso decreases as coffee stales. Robusta species of coffee creates more crema. Espresso crema often has different taste and aroma characteristics than does the liquid. Commercially grown coffee is either Robusta or Arabica. Robusta coffee is low quality and is bitter and unpalatable. Quality coffee does not contain robusta coffee. Arabica coffee grows in equatorial mountainous regions. Specialty coffee is a technical term used in grading green beans. Coffee is a shade loving understory tree. Enjoy our great new reusable ceramic travel mug. They are handsome and practical. They hold a 16 oz beverage. The double insulating wall protects your hand from burns and insulates both hot and cold drinks. They are dishwasher safe. And we have a pool of REUSEit travellers at the café so you can swap the used one in your car for a clean one in the cafe! Or not. We’ve been tasting a lot of coffee in the past week or two. We have a a couple new crops coming online. When the crop year changes, we need to adjust our roast profiles for the annual variation of characteristics. We roast and compare new crop to old crop on the same profile, and we tweak profiles until we arrive at a cup that we settle on for production. Randy and I have been enjoying coffee tasting together for over 6 years. We have formalized the process, but we don’t call it “cupping” because, for really good reasons, we don’t follow the that process. Instead we developed our own tasting protocol that helps us explore our experience. Here are some of our interesting findings. Over the years we have noticed that I frequently identify almond in the coffee while Randy identifies vanilla, or I find basmati and Randy finds coconut. When mentioned each of us can see the other. It is not being suggestible, it is a change in perception. Like when looking at the “My Wife and My Mother-in-Law” cartoon and it suddenly changes from the young woman to the old woman and back. Tasting is like that. By changing perception, the same characteristics in the cup might present a different picture. Introducing our New Organic-Fruit Smoothie! Introducing our new smoothie made with certified organic fresh fruit. We have developed the recipe and WOW is it fabulous! 100% organic fresh-frozen* fruit, sugar-free, vegan, non-GMO. Oh! …and in case you haven’t heard, all of our cups, lids and straws are biodegradable. We are proud to announce today that we are an Endorsing Organization of the Protected Places Declaration. This Declaration urges the Ontario and Canadian Governments to to protect at least 17 percent of the Canada’s land and inland waters by 2020. Both Governments have already committed to this target, now it is up to us to help them keep their promises. Too often, we all agree to do the right thing, only to have it fail during the implementation – we must not let it fail this time. We must protect our wilderness while we still have a wilderness to protect. In Canada, we have been blessed with an abundance of Natural Resources and we have built one of the world’s leading economies by harnessing those resources and, until now, we have done so with little regard to how much of those resources we have consumed in the process. It has been like a party that never ends. One day, the party will be over. Our land and water sustain us. They are part of a complex system that produce our food, water and the air we breathe. How much can we destroy before everything collapses? Why is Birds & Beans taking a position? We know what you are thinking – we roast coffee, so why do we care about protecting land and water? Well, a little over 15 years ago, we chose to create a company that could demonstrate that it is possible to have a company that helps to protect the environment and make a living doing so. Protecting habitat is one of our core values and we are always looking for ways to do this, whether big or small. Our core product, Certified Bird Friendly coffee, preserves valuable habitat with every bag we sell. This habitat provides homes for many creatures – including essential winter habitat for our migratory songbirds – and hence its name. Preserving that habitat has an impact far beyond the forests of South & Central America as it helps to preserve the populations of songbirds and that are now returning to their North American breeding grounds. The more of our coffee that you buy, the more habitat we save. Together, we can make a real difference. Other companies don’t do this – you will see larger companies make some token gestures but they hide behind the veil of “maximizing shareholder value” as a reason for not doing more. We take a broader view of shareholder value and some of our shareholder value resides in the forests, parks and gardens of North, Central and South America. We ask other companies to join us as we can’t do it alone. Sign the petition and share it with your friends and ask them to sign too. More information is here. For those of you who live in Ontario – there is an election taking place – ask your candidates if they will support the Protected Places Declaration if they are elected. Let them know it matters – we will be expecting the next Government to make sure this target is met. While enjoying your next cup of coffee, why not support the Ottawa Valley Wild Bird Care Centre? We donate $1.50 from each bag sold to OVWBCC who care for ill, injured and orphaned wild birds found within the community and releases them back into the wild. Of course the coffee is certified Bird Friendly, because caring for the birds extends to conserving their habitat in Central and South America. Enjoy this coffee at full or 3/4 strength. It has a lovely sweet aroma, with tropical fruit and chocolate in the cup. It is a lovely smooth coffee with a long sweet aftertaste that rings pleasantly in the pallet after the cup is gone. Brew this 3/4 or full strength for best effect. Howler Monkey high tailing it! Bird Friendly coffee is not just for the birds! Hummingbird nest on a Bird Friendly coffee farm. Our coffee growers are on the front line preserving forest ecosystems. Bird Friendly coffee cultivation has lower yield than conventional coffee, but look at all the good it does! 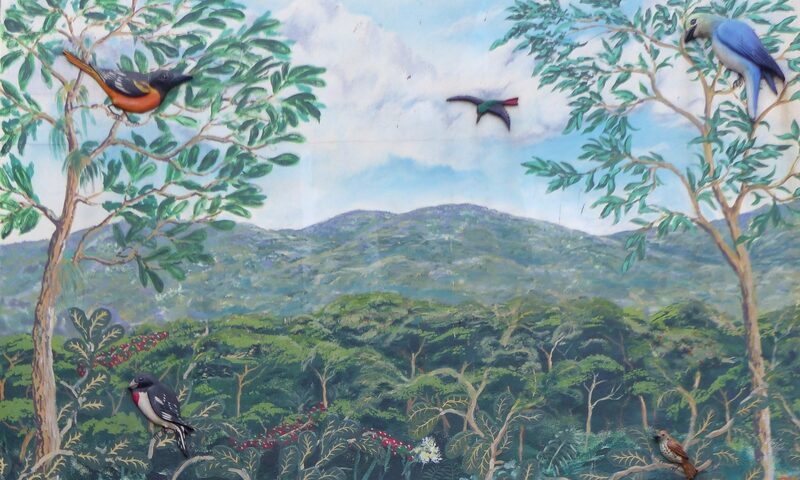 All of these pictures were taken on Bird Friendly coffee farms. Every pound of coffee we sell preserves 147 square ft of forest habitat. A subscription of a pound a month maintains 1760 square feet of this forest! That is about the size of a city lot. One person can do that by choosing certified Birds Friendly coffee. Expertly roasted to reveal hidden flavours. Some of you might recall the viral video of the sea turtle who was lucky enough to have the plastic straw lodged in its nose removed. An article was brought to my attention today entitled “A Brief History of the Modern-Day Straw, the World’s Most Wasteful Commodity“. While others might look at the pictured straws and see pretty colours, I see, and feel, the pain and suffering caused by single use plastics. The straws at Birds and Beans Café are biodegradable. We do not offer anything in single use plastic … including water. Our single use cups, lids, straws and cutlery are all biodegradable. We pay several times more for our biodegradable straws than we would for plastic straws. For us plastic straws are not an option. The real price of plastic straws is not in the sticker price. No-one in the supply chain, including the end user, pays the real price for single use plastics. Instead, the enormous price is paid in the suffering of the worlds creatures and in the ever increasing stresses borne by the web of life. The remains of a baby albatross and the contents of its stomach. While writing this, I reread this throwback to 2012 when I banished the last plastic from our offerings. At Birds and Beans, we incur the higher cost for a biodegradable straw, which is, in my assessment, much better value. Birds and Beans was conceived as an expression of our personal values. In founding Birds and Beans, David and I decided that we would buck the most powerful trend in the current culture – the one that dictates that we must maximize monetary return at the cost of everything else. By contrast, we steadfastly defend the values of product quality, ecological sustainability and quality of life, despite a lower financial return. Yes, that’s right. We dare to put our values before money: we value our values! And it is a real financial investment. We continuously strive to expand our understanding of the impact of human activity, and we use our choices to withdraw our support from those conventional processes that have monstrous consequences1. Instead, we throw our support behind processes and supply chains that are aligned with our values. Conventional suppliers may not miss our business, but alternate suppliers do feel our support! We know that many of you look for meaningful opportunities to express your values, and we hope you will engage with us in our endeavor. Our deep and ongoing engagement with the community . Our commitment to our co-workers through a generous employee ownership program. From Organic Meadow's "Meet Esther: An Organic Cow Story"
We choose to operate a business that is mission based and we accept the enormous increase in complexity that this requires. We reach out directly to our heroic growers who are on the front lines in defense of the remaining forests in coffee growing regions. We support them with prices that sustain them and their families. We form and nurture long term relationships with them. They are secure in future sales from us, and we depend on them for our ongoing supply of their meticulously tended coffees. We celebrate our support of several dozen small suppliers and not of Costco, Sysco, or Gordon even though it results in a tremendous increase in complexity. Instead of ordering from 1 or 2 suppliers who provide whatever is needed that week, we manage inventory levels from over 30 suppliers, each with different order cycles, balancing minimum order requirements with spoilage, and delivery charges with the cost of product. Each supplier maintains their specific payment and delivery terms. Each supplier has their own shortages, which are much more common from our suppliers than conventional suppliers, because each of them face similar difficulties as do we. All this requires a constant resource stream to monitor and manage. We do this happily in support of our like-minded suppliers who need our support to maintain and strengthen their part in alternate supply chains. We offer them our support by accepting the inconvenience and complexity and by paying them higher prices. We do most of our baking in-house from scratch because it is not possible to offer fresh, quality products that embodies our values any other way. We teach our staff about our values, and we ask them to support them with their best efforts. We offer noticeably higher compensation than most foodservice employers. We meet or exceed all the standards set in Ontario’s Employee Standards Act. We are a team and sustainability must apply to all of us or it isn’t really sustainable, is it? So that’s it. Could we make more money? Yes. We could drop any one of our commitments and make more money tomorrow. Would we even consider it? No. We are not trying to maximize profit. We are trying to maximize value… and we measure value with more than just money. Monstrous consequences like the appalling suffering inflicted upon factory farmed animals, the starvation of baby albatrosses whose parents see shiny plastic as fish, the burning of entire forest ecosystems in Indonesia to grow Palm so “big food” can have “cheap” oil. Mimico Joe Story in Lakeshore Villages! Now Serving Cheese and Dill Scone! We are proud to offer this unique scone made with all organic ingredients. What a delicious and beautifully textured scone it is! Great for breakfast or lunch. The organic ingredients mean that it, like all of our baking, our great new scone is 100% GMO free and 100% cruelty free. These important qualities are shared by everything we bake. We believe that honouring our core values results in better taste and better health. All our coffees have the Canada Organic logo. Above shows how our packages display the Canada Organic logo with reference to our certifier, Ecocert Canada. It is not legal to display the Canada Organic logo on a package without referencing the accredited certification body. From the CFIA FAQ: “[Understanding] these regulations enable consumer protection against deceptive and misleading labelling practices and claims regarding organic products.” The CFIA vigorously defends the use of its logo and the certifying bodies are always willing to provide credentials for any product bearing their name as a certifier. By the way, if you ever see a product with a Canada Organic logo without the certifier, you should report it to the CFIA. Such violations are rare, and sometimes inadvertent, but the integrity of the system relies on all of us participating and being vigilant. When we say our coffees are Organic, we mean all of our coffees are certified organic 1 by Ecocert Canada. All our coffees are certified organic: we offer no conventional coffee. Many coffee marketers include some organic coffees in their line, while deliberately making no comment about the conventional ones, in hopes that the organic ones will “greenwash” their line. Others claim that their coffee is organic while not submitting to the costly and rigorous verification process of certification. Sadly, in Ontario, due to a lack of commitment to the Canadian Organic standard from our provincial legislators, this is not prohibited and leads to much confusion and abuse. All of our offerings bear the organic Canada Organic Logo. And bearing the Canada Organic logo is a big deal! Organic certification is a rigorous process. Obviously starting with certified organic beens is a prerequisite. Beyond that, we are required to keep accurate, retrievable records of all purchases, all roasts, all packaging, all spoilage and all sales of organic coffee. Our practices must comply with the Organic Products Regulations, 2009 as governed by the Canadian Food and Inspection Agency (CFIA). We are required to comply with Canada’s Organic Labeling Laws, our trade documents are subject to strict regulation, and we are subject to inspection and regulation by an accredited Organic Certifier who is responsible to ensure our compliance. Our certifier, Ecocert Canada is one of about 20 organizations in Canada accredited by the CFIA to bestow the Canada Organic seal on compliant organic products. At our cost, Ecocert Canada conducts an annual audit in which they review our internal documentation, trade documents, practices and procedures, labels, and inventory and more, all to ensure our compliance with the Canada Organic Standard. In our annual audits, we must prove compliance with record keeping rules and standards. We must demonstrate compliance with record keeping requirements. Auditors conduct spot exercises to demonstrate completeness and accuracy of all of our records. They reconcile inputs, outputs and check that all inputs arrived with compliant packaging and with rigorous documentary credentials. All of our sales must be likewise documented and packaged. All of our labels must be approved by Ecocert who ensure they meet labeling rules, that the package claims are correct, and that internal and trade documents are all in alignment. The system works because all participants in the chain are subject to this scrutiny. I trust that the inputs into my process comply with the organic standard because they too were rigorously verified by independent, 3rd party accredited bodies. We at Birds and Beans are proud to support the chain of organic certification. We strongly believe in third party certification. Certifications are a way for us to participate in a voluntary chain of trust while harnessing third party verification. On certification, we are soaring above the crowd™. Now Shipping with New Bird Friendly Logo! Look for the new Bird Friendly logo on all of our coffees. They are ALL certified organic coffees grown in Certified Bird Friendly Habitat! Today we start shipping with the new Bird Friendly logo! We are thrilled that the new logo now appears on both the front and back of all of our coffees. Bird Friendly is the only certification that takes organic coffee to the next level: It guarantees that our “shade grown” coffee is not just a claim on a label, but is certified to provide quality wildlife habitat. Certified Organic and Bird Friendly coffee cultivation looks like this! When you purchase coffee that is certified organic and shade grown by the SMBC you have the assurance of the Smithsonian Institution that you are conserving wildlife and biodiversity. ALL of our coffees have the seal… every cup of Birds and Beans coffee you drink is a gift of habitat to the world. Meet the New Bird Friendly Seal! When birds migrate home, so does Birds & Beans coffee. Celebrate spring migration with Free Shipping on Roasted coffee* orders over $45. And to make it even better, we’re extending the offer to all orders over $45 that contain at least 1 lb of Roasted Coffee. * Offer applies to ground shipping to destinations within Canada only. Canada Post Air Stations excluded. As Coffee Roasters, we know green coffee beans. Green coffee beans are our raw material. Great roasted coffee can only come from great green coffee. Our beans have been carefully selected so that we can offer a full range of coffees to sell online, serve in our cafe, and deliver to our wholesale partners. We’ve spent the past 15 years refining our choices of beans so that we have the highest quality specialty grade Certified Organic, Bird Friendly and Fair Trade Arabica beans available anywhere. These are the ones that we sell for for you to roast at home. No old crop specials, no cheap or tainted beans. People often comment how clean and defect free our beans are when they first see them. You can see the quality as much as you can taste it. Our prices are competitive, especially when you consider the quality, sustainability and ethical values – and you can also order the same coffee roasted by us to use as a benchmark for your roasting. We ship across Canada from our Toronto area Roastery. So whether you are roasting on your stove using a popcorn popper, on a BBQ or using a small home roaster, you can easily start with the best beans and feel good knowing that with every cup, you are helping to conserve vital habitat and supporting small family farms in coffee growing regions. The Smithsonian Seal appears in the new logo. Have a look at the new Bird Friendly logo… the seal that represents the gold standard of forest habitat. There are several things worth pointing out in this logo. We love that it illustrates several aspects of good habitat, like a variety of species, varied heights, and dense coverage. The change in phrase on the seal from “Bird Friendly” to “Bird Friendly Habitat” points to the “friendliness” of Bird Friendly coffee: that it is grown in forest and preserves that habitat (see our post “What is Bird Friendly Coffee”). We strongly support the refocusing on habitat: Forest habitat is not just for the birds! Forests are the lungs of the world. Bird Friendly habitat is a functioning, biodiverse ecosystem that supports and is made up of a web of inter-connected creatures, like monkeys and butterflies and beetles and native trees and plants and… oh… our wintering migratory songbirds. It is also great to see the seal of the Smithsonian Institution within the logo. The Smithsonian Institution is one of the worlds most respected knowledge organizations. It is world’s largest museum, education, and research complex, with 19 museums and the National Zoo. The Smithsonian Migratory Bird Center (SMBC) is a department within that most prestigious organization. It is the scientists at the SMBC who developed and who administer the Bird Friendly® certification. When you purchase coffee that is certified by the SMBC you have the assurance of the Smithsonian Institution that you are conserving wildlife and biodiversity. And ALL of our coffees have the seal… every cup of Birds and Beans coffee you drink is a gift of habitat to the world. After proudly displaying the old logo for 15 years on our coffees we hope you will join us in congratulating the SMBC on the introduction of their new seal. We use it throughout this website and we will be transitioning our packaging within the coming weeks. Baby hummingbirds on a Bird Friendly coffee farm. Show us your Mimico Joe! Show us your Mimico Joe! Use the hashtag #MimicoJoe to be entered in our monthly draw for Birds & Beans Gift cards and Mimico Joe T-shirts. Mimico is our home and we love it, which is why it deserves to have its very own coffee blend. Let’s celebrate it. Share your pics of Mimico, Birds and Beans coffee cups, Birds and Beans coffee bags. Be sure to tag them #MimicoJoe on Facebook, Twitter and Instagram to enter. All winners must be able to pick up their prize in person at our Café … in Mimico. And the t-shirt! It’s a good one: made in CANADA out of an Organic Cotton/Bamboo Blend and is available in Men’s and Ladies’ styles for only 24.95 each! A muskrat in Humber Bay Park. About 15 years ago, we established Birds and Beans on the shores of Lake Ontario in Mimico. Although at that time Mimico was rather down on its luck, battered by the loss of its industrial base and suffering from the lure of malls and big box stores, we fell in love with soul of Mimico. The now demolished building has become the site of Mimico Square. We saw a diverse neighbourhood full of hard working, long term residents who shared a connection with the lake, a pride in what had come before, and vision of the future. So we set down our roots and began working towards that future. And then around us, slowly at first, then more and more, Mimico began to thrive! The neighbourhood feels energized by life in the new condominums, and the residents are enjoying the ever improving Mimico waterfront, new storefronts, and Mimico’s evolving character. We are expressing our love of Mimico by introducing a coffee blended and named for our ‘hood! Perhaps the first coffee to celebrate its home neighbourhood, Mimico Joe is approachable, unpretentious, authentic, solid, and full of interest… just like Mimico. We also offer Mimico Joe t-shirts for those of us who are proud Mimico Joes. A great shot of the cafe by photographer Justin Blathwayt. Come in to Birds and Beans Coffee and treat yourself to something special! Our coffees are all certified organic, bird friendly, and fairly traded, boutique coffees. We use Organic Meadow Milk in our latté and cappuccino. Treat yourself with 100% shade grown shaved chocolate on your specialty drink. Even our milk table offers organic milk and sugar. We’re the real deal! Every day we offer four brewed coffees. Our menu board identifies the coffees on brew and their roasted dates — always within the last few weeks. Our house coffee, the Daily, is a certified Organic-Bird Friendly® coffee with enough interest for every coffee lover. You can also choose from our daily Organic-Bird Friendly® bold coffee, feature coffee or decaf. We offer the best espresso, latté, cappucino and americano in the city made from the only Bird Friendly espresso in Canada! We blend our espresso to compliment the flavours the organic milk in a latté or cappucino. Our baristas are trained to pour espresso perfectly every time so it has the great great crema and aroma with flavours of chocolate and malt from the approach to the finish. We bake all of our treats from scratch daily using organic eggs from happy hens (see Chicken Out! ), organic dairy from happy cows, and 100% GMO Free ingredients. Our breakfast cookie is a daily favourite in the neighbourhood with rolled oats, hazelnuts, sunflower seeds, honey and cranberries. Our chocolate chunk cookies are absolutely without rival! We use our shade grown Plantations Chocolate. We offer a the cookie with either milk or dark chocolate. What a treat! For lunch we offer simple wraps and sandwiches with hand crafted Sunflower Kitchen GMO free vegan soups. All are certified organic and, so cruelty free! No factory farmed product allowed. We use Raincoast tuna in our tuna salad, the highest ranking sustainability grade from Greenpeace. Our egg salad is homemade from fresh certified organic cage free eggs so it is always fresh and tasty. Even our cheddar cheese is certified organic from Quebec, and so produced from well treated animals. We offer spinach empanadas from the Empanada Company in Long Branch. We love to keep it in the “hood”. The link for cardholders to check balance and transaction history is here. Many of you know that Birds and Beans café has offered gift cards for 12 years, but this year they are even better! Our new gift cards have grown up from being administered manually, to an electronic debit card with great new features. The gift card has the look and feel of gift cards from major retailers. This ensures your recipient will feel confident using the card, and you will be proud to give it. Once activated, the card can be used at the cafe like a prepaid credit card. The cards are reloadable, and a 10% discount applies to reloads. So your gift will extend throughout the year! The card is secure, and transparent. The cardholder can view their current balance and historical transactions online. The cardholder simply enters their card number and their current balance is presented and a link is presented to access to the historical transactions. The link for cardholders is here. So isn’t it a good time to introduce your friends and family to your favourite café? Quality habitat for as far as the eye can see! As we near the end of the summer, many of us will be shifting our focus towards new routines at work or school. Similarly, many species of wild birds will shift their focus away from breeding and will put all their energy into reaching their wintering habitats in Central and South America. Our migratory birds spend their winter months in the lush forests that provide the food sources and protection from predators that migratory birds need to thrive during our harsh winters. In a recent interview available here, Dr. Robert Rice of the Smithsonian Migratory Bird Centre (SMBC) describes the importance of forest grown coffee to migratory songbirds. Dr. Rice points out that under the pressure of unsustainable agriculture, traditional forest coffee farms are often the last viable habitats available for migratory songbirds, monkeys, butterflies, reptiles and other organisms. The SMBC has characterized healthy functioning forest environments and they offer the Bird Friendly® coffee certification to coffee grown within them. Dr. Rice notes the small proportion of world coffee that bears the Bird Friendly seal. He humbly recognizes that as scientists the SMBC has created the certification, but do not have the marketing skills and channels to increase demand. He asks that we, individually and collectively, notice the opportunity to preserve and restore forest ecosystems in Central and South America by asking for coffee Bird Friendly® seal. Or you can just buy it from us 😉 All our coffees are certified Bird Friendly. Bird Friendly coffee preserves habitat for forest creatures in Latin America including our migratory songbirds. Coffee that is certified Bird Friendly grows in an agro-forest. The Smithsonian Migratory Bird Center (SMBC) certifies that these forests provide good habitat for wildlife. All Bird Friendly coffee is first certified organic, and then goes much further adding standards for shade cover, plant species diversity, canopy structure, required buffer zones, leaf litter cover and much more. These are all necessary for wildlife to flourish. Read more on Bird Friendly criteria here. Conventional sun coffee. The lush forest ecosystem is replaced by monoculture. Coffee grown upslope provides habitat versus downslope sun coffee farm. In Latin America, where most of our migratory songbirds spend their winters, deforestation for agriculture is happening at an alarmingly fast rate. Forests are mowed down for monoculture and the impact on wildlife is devastating. Huge declines in our migratory songbirds are noticeable to those of us old enough to remember the plentiful songbirds here in Southern Ontario only 20 years ago. You can help slow the rate of deforestation by purchasing Certified Bird Friendly coffee. This supports those growers who valiantly maintain the front-lines of the resistance to this overwhelming destruction. Bird Friendly farms provide habitat for a wide range of species, not just birds! By choosing Bird Friendly certified coffee, we support the growers who steward forest ecosystems. Beyond preservation of ecosystems and diversity of species, Bird Friendly stewardship also results in soil conservation, pest control, pollination, water storage, carbon storage and climate change mitigation. Preserving expansive and diverse forests in central and south America are necessary to world climate and the well being of global systems. They have been called the lungs of the world and they mitigate climate change. Read more on ecological benefits here. Sometimes the phrase “Shade Grown” is used on coffee labels as if it were equivalent to Bird Friendly. Unfortunately, this is like accepting “natural” as equivalent to “organic”. While Bird Friendly coffee is indeed “shade grown”, we need to go a bit deeper if we want to ensure our good will hits the target. It isn’t the shade that provides the habitat but the fact that Bird Friendly farms are functioning, biodiverse, forest ecosystems. The SMBC developed the Bird Friendly coffee certification so we can confidently choose to support produces who grow their coffee in harmony with forest dwellers… Forest dwellers like this troupe of howler monkeys David saw on a Bird Friendly coffee farm in Nicaragua. Sales of Certified Bird Friendly coffee also help to fund the research performed by the Smithsonian Migratory Bird Center. This research advances the understanding of migratory birds that we need in order to preserve them for future generations. Look for the seal on the bags when you buy your coffee. You will find this seal on all of our bags. At Birds and Beans we are forever expanding and deepening our commitment to sustainability. As we learn about issues and find solutions, we weave them into the fabric of what we do. Some years ago, we were struck by a beautiful impactful art project by Chris Jordan that beautifully exposed some consequences of thoughtless plastic waste. We posted this and never ordered water in plastic bottles again. Birds and Beans is proud to be free from plastic bottles since May 2012. The life cycle of a plastic bottle has harmful effects to the environment throughout every step of the chain: from formation to disposal. For more information on the life cycle of a plastic water bottle, check out this Ted-Ed video. We are an official Quench Water Re-fill Location. Bring your reusable water bottle and we are happy to fill it up with filtered tap water. We offer a pitcher of iced water with glasses for customers to enjoy in the cafe. We also offer a bowl of water for the four-legged bunch. Despite all of these options, people still want to buy water to go. We want to make you happy, so we investigated options to provide a take-out water option without contributing to the Garbage Patch, harming animals who mistake micro plastics for food or degrading the quality of the soil that supports us. The Boxed Water folks in Michigan came up with the great idea of offering water in boxes. Boxes are made from trees, which is a renewable resource. Conservation is important to them, so the trees being used come from well-managed forests. The cartons are 100% recyclable. Less resources are used when shipping the boxed packaging to the locations where water is filled compared to plastic bottles because boxes can be shipped flat. The water inside is purified with UV, carbon and reverse osmosis filtration. As a bonus, know that 1% of Boxed Water revenue is being donated to reforestation and world water relief. Please enjoy our free filtered water. If you need to, enjoy Boxed Water knowing that it is a more sustainable option than anything packaged in a plastic bottle. Last week, news surfaced that a Toronto Restaurant was misleading its customers by claiming that dishes and certain ingredients were special in terms of being premium, organic or local when they weren’t. Many people are willing to pay a premium for special products such as these and so for the unscrupulous vendor, there’s an opportunity to increase price without increasing their costs by engaging in a little creative menu writing. We find this to be very disappointing and it raises the question of how can you be sure that the claims on a menu or a package are true? While it is possible to claim that a product is certified when it is not, there are checks and balances in legitimate certification systems that help you determine that product claims have been verified. In our case, we are a certified Organic Coffee Roaster and we publish our Organic certificate annually. Our certifier, Ecocert Canada, verifies each organic claim we make. We are required to maintain meticulous records. We are inspected and our records are checked every year to ensure we are compliant with Canadian Organic regulations. In the case of many certifications such Fair Trade and Bird Friendly, you can look up if the supplier is registered with the Certifier. If a restaurant claims a product to be Organic or local or heirloom or special in any way, they should be prepared to explain the basis of the claim. So ask your server, if it is local, what farm did it come from? When? if it is organic, is it certified or how do they know it is really organic? The more people ask for details, the more difficult it will be for restaurants to mislead their customers. Choosing sustainable, local, or artisanal foods can be rewarding in terms of tastes and the food experience and are often well worth the premium price, as long as we are getting the products that are being advertised. Many of the world’s companies pay no attention to how their supply chains are damaging forests, the Prince of Wales has warned as he urged action to stop deforestation. At Birds and Beans our founding mission to preserve biodiversity directly supports climate objectives: preserving habitat is preserving forests. French Foreign Minister Laurent Fabius spoke these words as he declared that the Paris Climate Change conference known as COP21 had reached an historic multilateral agreement. It is our sincere hope that he is right and that people of all countries see this as a call to action — It is the beginning of a process, and not the end. The agreement is significant – nearly 200 countries have committed to a goal of limiting temperature increases to no more than 1.5 degrees C above pre-industrial levels, rather than the 2 degrees that appeared to be the target just two weeks ago. The agreement is the product of a lot of hard work by many people. From where I sit it seems that much credit is due to French President Hollande and UN Climate Chief Christiana Figures. As Canadians, we are delighted to see a change in the position of the Canadian delegation from obstructionist to constructive. Delighted children try birding on a Bird Friendly® coffee farm. As important as this agreement is, it is just the beginning. The work lies ahead and we will face many obstacles and difficult choices in pursuing it. To achieve the goals set in Paris, we will need to use the agreement as a framework to help us maintain our collective resolve as we face the challenges of necessary change together. As consumers, we have a big impact on carbon emissions – we make choices with far reaching consequences when we spend our dollars. Consumers reward the behaviors of everyone in the supply chain with every purchase we make: Participants in the supply chain do what the monetary rewards incent them to do. To curb extreme climate change, we will have to change deeply embedded common practices by changing the influence of monetary rewards. Taxing carbon will help with this and it can work more quickly and more effectively if we understand it and if we consciously support behaviors we want to encourage in supply chains. At Birds and Beans our founding mission to preserve biodiversity directly supports climate objectives: preserving habitat is preserving forests. And preserving forests has been identified in Paris as a critical component to achieving climate objectives. Sadly, during the decade and a half that we have offered this climate and habitat friendly coffee, we have seen an explosion in demand for unrecyclable plastic single serve pods containing unsustainable sun grown coffee. Single use coffee pods are the source of a great deal of profit (coffee offered in pods nets out to about $50 per pound!) while convenience brands ignore adverse environmental impact of their coffee and other unsustainable food offerings. We maintain that using a grinder, a kettle and a drip filter holder is just as convenient a method of brewing a single cup of coffee, but has the merit of supporting an entirely sustainable supply chain. And the superior flavour in the cup is incomparable! This is one example of the kind of change that we as citizens can make as climate objectives are pursued. Our government reached an agreement because they believed it to be an expression of our collective will. As policy changes result in choosing sustainability over convenience, waste and unchecked growth, we will have to demonstrate our support. Let us make sure that our commitment runs deep and that no future government will be tempted to break the agreement for their own short term political gain. We are the citizens of the world at a the moment of truth. Collectively, the future is in our hands. We’re delighted to introduce our second Special Edition coffee: The Messenger Blend, produced in association with The Messenger Documentary – a film by Su Rynard. While the full length documentary explores the impact of our activities on birds around the world, it also offers solutions and inspires its audience to become more “Bird Friendly”. The Messenger Blend is an important part of that program. Coffee drinkers can make one simple and easy change that will help both birds and coffee farmers – choose to drink Certified Bird Friendly organic coffee. This will guarantee that vital winter habitat is preserved for our migratory songbirds and the other creatures inhabiting those forests. It does so by paying a premium to the farmers who steward the forests for the coffee grown within them. You can support them just by changing the brand of coffee that you drink, and, if you already purchase specialty coffee, it won’t cost more. The Messenger Blend is sourced exclusively from Certified Bird Friendly Shade Grown Organic farms. Every bag you buy helps to preserve vital forest habitat for future generations. Since we here in Canada share these migratory birds with the people of Latin America, we’ve increased the impact of the Messenger Blend by donating 10% of all sales to Bird Studies Canada – Canada’s leading science-based bird conservation organization. Every bag you purchase will also be helping to promote conservation here at home. The Messenger documentary is being released more widely and we encourage you to see it. One of the best parts of my job is speaking to passionate people – people who are passionate about coffee and also people who are passionate about the environment. Some people are passionate about both. A few months ago, I had one of those conversations with Elaine Munro of Progressive Nutritional Therapies. They had been purchasing Birds & Beans Certified Bird Friendly coffee for their office and were using it to raise funds for a tree planting near the source of the Rouge River in North East Toronto. In the office, they charge by the cup and were also selling jars of beans for brewing at home – and called it “Grow a tree in your Cup”. They are pretty big coffee drinkers over there because when it came time to plant – they had raised enough money to plant 513 trees! In early May, 24 members of their staff along with family members turned out to plant a selection of native trees and shrubs that were selected to be appropriate for the river side site by Ontario Streams. This is amazing – through this simple, yet creative program, they were able to both protect habitat in South and Central America by supporting Bird Friendly coffee growers, and improve habitat here at home in the Rouge River valley. Congratulations to all involved! For the complete story see the Progressive Nutritonal Therapies Blog and for more information. As spring returns and our beloved migratory songbirds make their way back to Canada from their wintering grounds in Central and South America, we urge you to support them by purchasing certified Bird Friendly® coffee! Our friend and supporter Vincent Falardeau would like to remind us of the beauty of the birds. He has a permanent show of his photographs in our café. And we would like to remind you of the beauty of the coffee. Lets do one simple act that sustains these beautiful birds and enriches our lives with a simple pleasure. Help us help the birds. Buy our certified Bird Friendly® coffee. A Delicious Way to Support Ontario Nature! We are excited to announce the introduction of our first Special Edition coffee, “Ontario Nature” Blend. This is a special blend in many ways. It is Triple Certified: Bird Friendly, Fair Trade and Organic, and like all of our coffees, is is roasted and packed using 100% green energy from Bullfrog Power. And, if that isn’t enough, we are taking it over the top, by donating $1.50 from the sale of each bag to Ontario Nature! Ontario Nature is a charitable organization representing more than 30,000 members and supporters and 150 member groups from across Ontario. They will use the funds to protect wild species and wild spaces through conservation, education and public engagement. Cape May Warbler stopping in our Etobicoke backyard on its return possibly from our Bird Friendly Nicaraguan coffee farm. By choosing to drink certified Bird Friendly coffee, our customers have always supported conservation of the neotropical forest ecosystems in which our coffee grows. Now, through Ontario Nature, you can support conservation of habitat in Ontario too – by simply changing the coffee you drink. Pickers pick only the ripe red coffee cherries at Gaia Estate. They allow the green ones to ripen and return for them another day. And what a wonderful coffee it is! It has a lovely honeyed aroma, with balanced tones of chocolate and nuts. It is a lovely, smooth coffee with a long, sweet aftertaste that rings pleasantly in the pallet after the cup is gone. We are so excited to launch our first Special Edition coffee that, for a limited time, we are offering FREE shipping of the Ontario Nature Blend any where in Ontario for orders over $25. A Monarch Butterfly visiting a Bergamot plant in our patio garden. On a related note – we add our voice to support the proposed changes to Ontario’s Weed Control Act that would remove Milkweed from the list and make it legal to grow. About time! Although it doesn’t have anything to do with coffee or birds, we are happy to see the David Suzuki Foundation’s current #GotMilkweed program aimed at planting more Milkweed to act as host plants for Monarch Butterfly caterpillars. We like it because it points out that helping to save a species (and in this case the phenomenon of the Monarch Migration) is all about habitat. Milkweed plants are an essential part of the Monarch’s lifecycle but it has been eradicated from much of the butterfly’s range – in cities and in the country thus destroying the butterfly’s natural habitat. The #GotMilkweed campaign’s goal is to replant a milkweed corridor in Toronto to help these insects increase their numbers. If the project succeeds, we would see patches of milkweed plant around us in the place of dull, boring grass. A new generation of children will learn the pleasure of playing with Milkweed pods and releasing the seeds and we will see more of these beautiful butterflies in the summer and fall. It is a small thing that can make a big difference – we see a future where we look for places to plant milkweeds and other plants to provide habitat and food for insects and birds. Imagine, for example, how nice it would be to drive down a highway and see milkweeds and other wildflowers making the scenery much more beautiful than the boring grass monoculture that has become the standard road side treatment. In the same way, we see a future where people ask for their Fair trade coffee to be Bird Friendly too, so every cup provides habitat for Migratory Songbirds in addition to providing a fair deal for farmers. More than 10 years ago, we set out to create a different kind of company – one that would give consumers a way to use their purchasing power to make the world better rather than worse. We wanted to provide a product that was green at its core – not something that just looked green or came out of a “green” facility with a super duper recycling program. We wanted to create a true “triple bottom line” company that produced tangible environmental and social benefits. Coffee was the perfect product for our experiment – for one thing, we love really good coffee and had a hard time finding a consistent source. And, most importantly, traditionally cultivated coffee is grown in a way that preserves habitat for wildlife – including Migratory Songbirds. Coffee is increasingly being grown in partial shade or full sun, transforming what was once a thriving forest ecosystem into “Eco Deserts” capable of supporting little life: Where there was once a thriving forest ecosystem, the only living thing is the crop being cultivated. A few years before we started Birds and Beans, The Smithsonian Migratory Bird Center had developed the Bird Friendly Coffee Certification. Its aim is to identify and certify farms that provided good habitat for migratory songbirds – or more accurately are functioning ecosystems. So, having identified the problem and the solution, Birds and Beans was born. We bought a small Commercial Roaster, some green Bird Friendly coffee and started developing our roast profiles. After about a year of development, we were ready to launch. We sold our first coffee at the Guelph Organic Show in January 2003. Now we are a Certified Organic Roaster and have 2 much larger roasters and a full line of Certified Organic, Certified Bird Friendly, Fair Trade and Direct Trade coffees. We offer the World’s first and only Triple Certified Espresso – Commit, an espresso blend. A decade later, we can declare our experiment a success. Birds and Beans is a going concern where every pound of coffee sold is helping to protect valuable habitat as well as contributing to a decent life for the farmers and their families. About 5 years ago, we were joined by Bill Wilson and his colleagues from New England, who wanted to use the Birds & Beans name in the USA – and out of that has grown a valuable partnership that is spreading the word to an even wider audience. Our coffee receives rave reviews from all who try it. Together, we are building a different kind of coffee brand. This month we are undertaking a ‘bird survey’ in Nicaragua on the 450 farm co-op, UCA San Juan del Rio Coco, co-sponsored by York University and Hawk Mountain Sanctuary. We buy a good deal of coffee directly from the co-op. The conservation biologists conducting the survey reported 21 species of migrant birds present in the first few days of field work. Supporting this kind of work is unheard of for companies of our size as it doesn’t have a commercial payoff. So why do we do it? Simple. Its because we have aligned our business with our true values and our business expresses them just as we do. It isn’t a ploy or a marketing gimmick. It is what we care about. We founded this company as a vehicle to promote conservation and this is an opportunity to do just that. The study represents new work in this region and so the findings will add to the body of knowledge of how that ecosystem functions. This will help our growers to make better decisions on how to manage their farms in the future. Thanks to all of you who have supported us and have enjoyed a different cup of coffee…. Our coffee of the month is the perfect Christmas gift for coffee lovers lovers! Send a different pound of our delicious Bird Friendly® of coffee every month. Or the same one each month if you prefer. Or every other month. Start the first shipment on the date you set so it arrives just before Christmas or in January. Its flexible! Pay in advance or pay as you go. Read more details here. As an added bonus this year, when you purchase a coffee of the month subscription of 4 shipments or more, we will send your recipient our beautiful 2014 Coffee Songbirds Calendar with the first installment (December or January) and one to you too! Our December coffee of the month offering is our 2013 Christmas Blend… A rich, smooth, delicious coffee with a festive label. Now isn’t Christmas easy this year? Our new Coffee Songbirds Calendar for 2014 is Available Now! This beautiful Calendar speaks for itself. Each month a different migratory songbird with text by Pulitzer Prize nominee Scott Weidensaul and a map of summer and winter territory courtesy of Cornell Lab or Ornithology. A great Christmas gift for the coffee lover, bird lover or conservationist! We are the cafe part of Canada’s leading roaster of Certified Bird Friendly coffee. Our location is unique – unlike any other we’ve seen. Out back we have a lovely patio with a view of Lake Ontario and a Native wildflower garden. The purpose of the garden is to provide habitat for birds and pollinators and to provide a beautiful backdrop for our patio. Behind our wildflower garden is a huge composter – where we compost our coffee roaster chaffe, grinds and kitchen scraps. Since we don’t fertilize or water the wildflowers, we really don’t have a great need for the end product but we’re pretty sure someone out there really needs some great organic compost. You are reasonably local to us and are in need of some beautiful rich organic compost. You are willing to do some of the work required such as turning the piles and able to give direction to us on the adjusting the mix of inputs if required. We’d prefer that you are a Community organization or perhaps involved in community garden but we will consider any one willing to help, You will have to agree to bag and remove the compost at your expense. So, if this sounds like a match made in heaven to you, drop us a line and we’ll get dirty together…. To contact us, leave a comment here or call 647-439-3294. There have been a number of disturbing reports about mass bee die offs in the news recently – such as this report of 37 million bees dying in Ontario. The cause of these die offs has not yet been establish but it is likely that they are being caused by a relatively new class of pesticides call neonicotinoids. Neonicotinoids are sprayed like other pesticides but are also increasingly being used to coat seeds of corn (and possibly other crops) so the seed may be sowed earlier — before the temperature and moisture conditions are right for germination and not be eaten by ground dwelling insects. The problem is that the insecticide makes its way into the leaves and the pollen of the plant and the bees take the pollen back to the hives and the pesticide kills the bees. It also appears that pesticide is introduced to the environment during the planting process, exposing bees and other animals at that point too. It is estimated that the majority of corn now planted in North America is now coated with Neonicotinoids – a rise that coincides with the increase in Bee Colony Collapse disorder. The link has not been proven yet, a fact the chemical companies are quick to point out but the European Union has introduced at 2 year ban on 3 neonicotinoids as a precautionary measure. The evidence is mounting and we suggest that US and Canadian governments should follow the same path – better safe than sorry. We lived very well before these pesticides were introduced and a temporary ban seems like the right thing to do while the studies are done. There’s another disturbing fact that doesn’t get mentioned in the stories – the bees that are dying are our domestic honey bees – the ones kept to pollinate crops and make honey. We’ve moved more and more to a model of agriculture that requires honey bee hives to be brought in to pollinate crops as we’ve reduced the biodiversity in farm fields to the point where they are eco-deserts – nothing much lives there except the crop we are growing. We have replaced the natural pollinators with domesticated bees — essentially hives of agricultural workers. And now, in our never ending quest to maximize yield and minimize immediate cost, we appear to be killing the domestic honey bees – our agricultural partners on whom we are utterly dependent. If we are unable to keep bees, we won’t be able to grow crops that depend on them for pollination but our governments do not act. If something was killing our cattle, hogs or chickens, we would see action – so why not for the bees? How will our crops be pollinated with out them? The simple answer is that they won’t be unless we take steps to protect the biodiversity of pollinators whether they be domesticated or wild. The native wild pollinators are being killed by the same agents as the Honey Bees and they are losing their natural habitat. The loses are hard to quantify because we don’t count them. Protecting the pollinator diversity requires 2 simple steps. 2. Stop poisoning the bees. So, what can we do? I encourage everyone to contact their elected representatives and urge them to support a temporary moratorium on the sale and use of Neonicotinoids. The justification for doing so may be found in something called “The Precautionary Principle” – which says we have a duty to prevent harm to the environment if it is in our power to do so, even though all the evidence is not in – or, in other words, Common Sense. You can also do your part to help reduce the market for the products of this kind of chemical intensive industrial agriculture. Start by supporting Organic and small scale local farmers. Summer is a great time to purchase local food at a Farmer’s Market – ask the farmers about the the food and how it is grown. Does it cost more to support the small scale farmers? It can do but you get benefits for that extra cost. You are strengthening your community, it is better for the environment and the food tastes better! If we all take some action on this, collectively we will have an impact. Downy Serviceberry flowering in our native habitat garden by the café patio. Finally, if you have a garden, plant some native plants that will provide a food source for our native pollinators. Our native bees are in trouble too but nobody is counting them so we don’t have the numbers. We must protect the species that we have, we are going to need them in the future. We have done this behind our cafe and we enjoy seeing a wide variety of bees visiting our native plants. In January, I had the opportunity to spend a week in Nicaragua, visiting a number of the farms that supply Bird Friendly® coffee to Birds & Beans – an experience that drove home the critical importance of such Smithsonian-certified shade coffee farms to the survival of migratory birds. Much of our time was spent in the country’s northern highlands, a region of exceptional avian diversity, where Birds & Beans is partnering with UCA San Juan del Rio Coco, a cooperative of more than 400 small family farmers, all growing USDA organic coffee, 60 percent of which is also certified Bird Friendly®. My guide was Jefferson Shriver, who with his wife Gabriela Narvaez runs Gaia Estate, also a Birds & Beans supplier. We met with the leadership of UCA San Juan, including their general manager Griselda Jarquín Lopez, and learned that the cooperative has decided to become 100 percent Bird Friendly® within three years – a significant step for this large, successful operation, which ships more than 2.5 million pounds of coffee each year. I also had a chance to see first-hand how important the traditional shade coffee farms of this region are to migratory birds. Whether one is driving north from Managua, or looking at the region from space via Google Earth, you’re struck by the realization that the highlands around San Juan del Rio Coco are an immense island of quality bird habitat, surrounded by denuded cattle pastures, grain fields and sun coffee monocultures. In the highlands, though, traditional shade coffee farming has preserved an oasis for birds. I was expecting farms that looked like, well, farms. Instead, the Bird Friendly® certified farms of producers like Marvin Venega look like almost untouched forest – high, complex canopies of native trees, draped with vines and spangled with orchids. In the shade of these forests, Venega and his neighbors grow not just coffee, but also cacao, vanilla, starfruit, cinnamon and a host of other crops – a system that is centuries old. The habitat they protect simply drips with birds. We found great, rolling flocks moving through the woods. There were migrants like Philadelphia, yellow-throated and warbling vireos; yellow, chestnut-sided and Wilson’s warblers; summer tanagers and rose-breasted grosbeaks. Mixed with them were flamboyant resident species like emerald toucanets, blue-crowned motmots and masked tityras. Baltimore orioles from the north fed beside yellow-backed orioles, and Tennessee warblers were everywhere. It was paradise for a birder like me, and I hardly knew which way to look. The coffee you drink makes a real, demonstrable difference for the birds that migrate to Central America. Because of the premium price they receive for Bird Friendly® coffee, farmers like Marvin Venega are actually restoring degraded habitat. Marvin proudly showed us an old corn field where, with the cooperative’s support, he has planted thousands of saplings of native trees and shrubs. Within a few years, this too would become vital habitat for migrants like blue-headed vireos and western wood-pewees. The habitat preservation that every bag of Birds & Beans coffee makes possible isn’t happening just in the northern highlands. We wrapped up our trip at Gaia Estates, not far from the Pacific coast, which Jefferson and Gabriela have turned into a model of organic, Bird Friendly® habitat. At daybreak, we sat on the deck of their cabin listening to flocks of parrots and parakeets screeching overhead. Dozens of western tanagers mobbed fruiting trees, while ruby-throated hummingbirds – perhaps the same ones that nest at our home in Pennsylvania – flitted from flower to flower. The woods were filled with hundreds of yellow warblers, and the more open areas were alive with scissor-tailed flycatchers and western kingbirds. Jefferson and Gabriela are now Birds & Beans’ official representatives in Latin America, helping us forge partnerships not only with farmers in Nicaragua, but in countries as far afield as Peru and Colombia – and in the process, to safeguard the kind of habitat that birds we all love must have to survive. For event brewing in a 100 cup perc urn, we find 14 oz ground coarse is great. When we roast a new coffee, we start with the SCAA brewing ratio. In our experience, this brews a strong delicious cup of coffee – in most cases. Interestingly, some coffees taste much better by reducing the ratio of coffee to water. The Nicaragua Gaia Estate coffee is much better brewed at about 3/4 strength (a little less than two tablespoons per cup). The SCAA recommends grinding the coffee at the time of brewing, so the measurements above are for beans. I measure out the beans and put them through the grinder. It makes less mess than trying to measure ground coffee too. If you are measuring ground coffee the amount needed may be a bit more or less depending on how compacted it is. The planet is becoming an increasingly inhospitable place for agriculture. This is especially the case with full sun, rain fed monocrops grown in the tropics where pounding rain, high winds, and long dry periods are an annual experience. Fortunately, coffee is a forest crop by nature, and forests can create natural buffers for such inhospitable conditions. As organic, agro-forestry farmers, we just help that process along a bit. The ecosystem is functioning in this “agro-forest” on the Gaia Estate. At Gaia Estate in Nicaragua, coffee was first grown here over 100 years ago by simply clearing a bit of the underbrush from a natural forest. The place looks much the same today, with over seventy species of trees on 90 acres. A thick blanket of leaf litter covers the ground all year, maintaining soil humidity, preventing erosion, and building up organic matter that our coffee loves. Our three story shade canopy of fruit and forest trees shields the coffee from strong rains and volatile temperatures, and slows the maturation of the coffee beans, giving the coffee more complexity and sweetness. The limes, bananas and avocado intercropped with coffee as that first shade layer give us plenty of fruit year round for our family, workers, and a bit of extra to sell. Most people say they feel they are walking through a park when they come to Gaia. We feel much the same way – like gardeners in a forest – and can’t imagine farming any other way. We know that Gaia is a refuge for migratory and resident birds, and a host of animals and insects. This is also very important to us. Since assuming ownership of the farm six years ago, we are seeing greater populations of migratory and resident birds, butterflies, lizards, iguana, and rabbits. We’ve even spotted a few deer and monkeys recently, the first to come back to this area in a long time. We don’t have to worry about the risk of worker exposure to poison because we don’t use pesticides or herbicides. The soil is alive with micro-organisms, worms and ants that all co-exist here given we use only organic fertilizer and repellents. Bird Friendly® certified coffee farms are a functioning ecosystem with biodiversity that rivals rainforest. I am hesitant to over-romanticize, however. Annually we apply a half bucket of organic fertilizer to every plant. Compare that to the bottle cap of urea we see our neighbors apply to their conventionally grown coffee plants, and you can see that our production costs can get expensive. All of the coffee cherry residues, horse and cow manure, and fallen branches we convert to charcoal are used to make a rich blend of organic fertilizer. Then we hand weed instead of applying herbicides like Round Up or paraquat. While this is also time consuming and more expensive, it allows us to let tree seedlings – spread by birds and bats throughout the farm – grow back and replenish the agro-forestry system over time. These kinds of practices also generate more employment, meeting a critical need in the local community. Finally, there is nothing easy about regulating the shade of trees 20 meters high. The pruning of branches is necessary to allow some sunlight in for the coffee, and requires careful handling for both the tree and the coffee below. On Bird Friendly® certified farms, trees must retain 80% coverage after pruning! Not everyone farms this way. As I write, in addition to the songs of at least a half dozen birds, I also hear the whirring of chainsaws in the distance. The value of trees in Nicaragua are calculated when they are horizontal, in board feet, not vertical and alive. Deforestation in Nicaragua, like much of Latin America, continues at a relentless pace. Tragically, most coffee markets do not reward farmers for growing coffee in the shade. There is no market value assigned to shade. Bird Friendly is a small but significant exception to the industry standard. If more people buy SMBC Bird Friendly coffee and demand grows, we would love to share the Birds & Beans and Bird Friendly certified market with our neighbors. After all, we are not an island – what our neighbors are doing ultimately affect our growing conditions and the health of the ecosystem we take care of at Gaia. The orioles and warblers and thrushes, if they could speak to us during their short visits here annually, would probably agree.